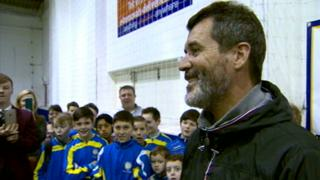 Roy Keane met with school children in Northern Ireland and urged them to enjoy football, throw away their mobile phones and climb some trees! The ex-Manchester United and Republic of Ireland captain - known for his fiercely competitive play during his career - told the kids they could take part in a range of sports, but it was imperative for them to "enjoy it". Has Roy inspired you to have a go at football? If you fancy taking part, you can find out how to get involved on our how to guide.